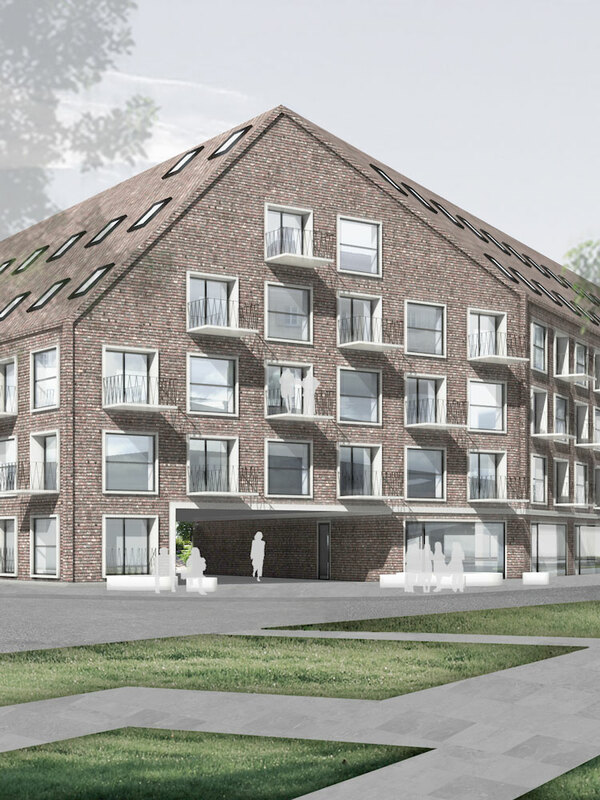 The project Südberg, the construction of a complete city block, illustrates how Nürnberg can master its current and future problems sustainably. In response to its surroundings, the building is trimmed back towards the adjacent squares. playfully solve problems: They organize the height differences in the structure, give an appropriate backdrop to the urban spaces surrounding them, and mark the three courtyard entrances. 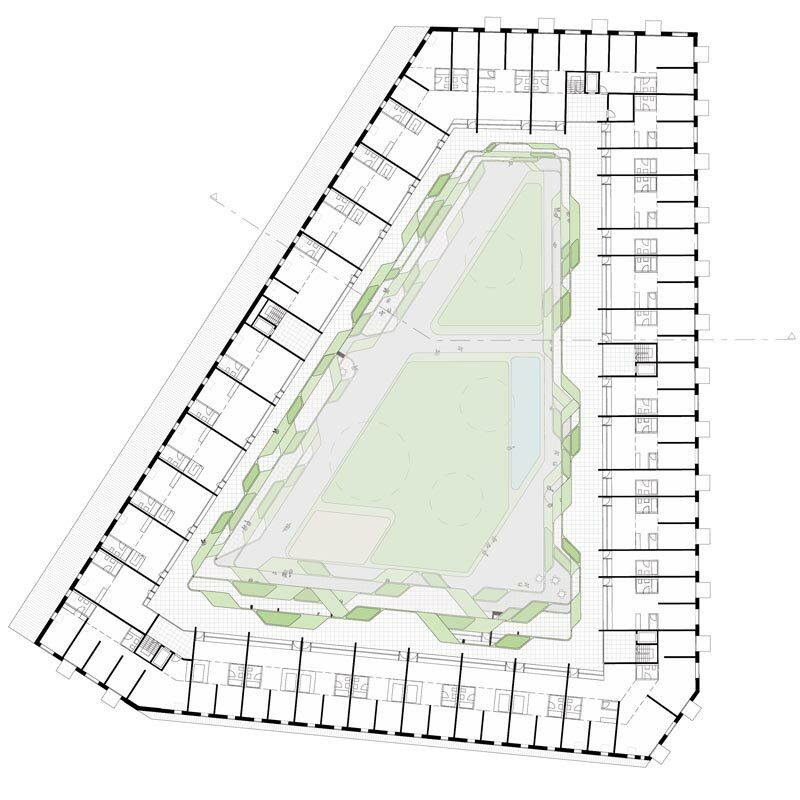 The final volume of the city block is determined by a reduction of the vast roof. is sympathetically incorporated into the existing architectural surroundings and at the same time creates a strong, exciting, and dynamic building within the city. 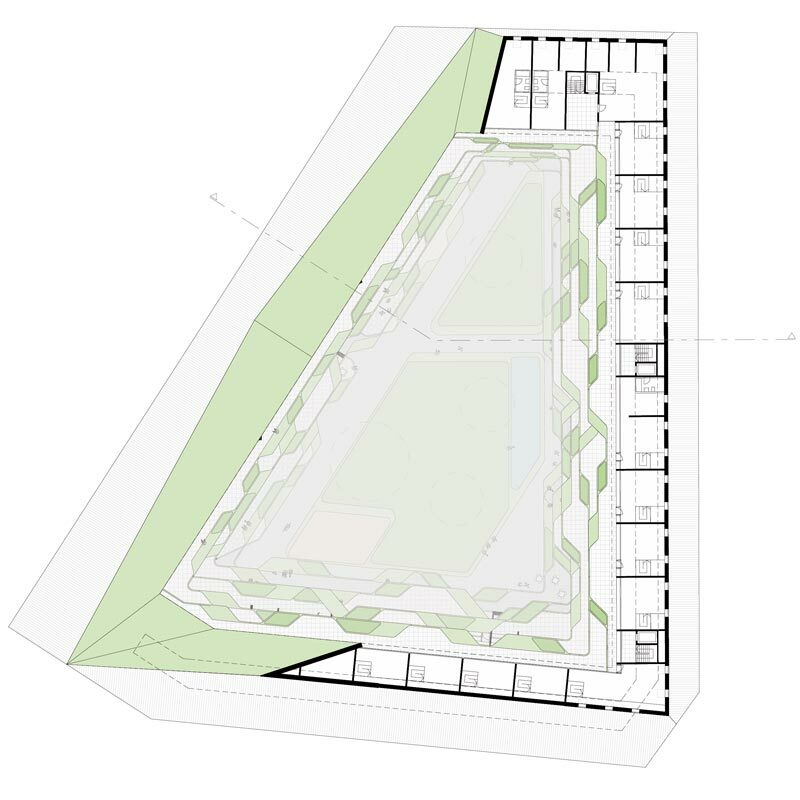 The inner courtyard, necessary as a natural light source, becomes the cornerstone of the new building block. 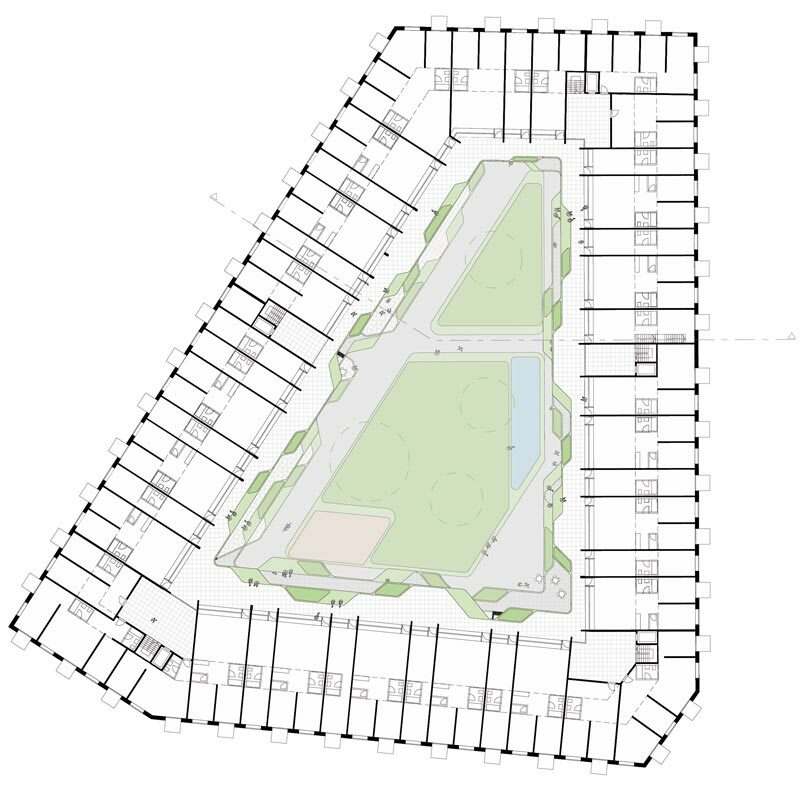 responds to the “green area” deficit, transforming into a green oasis for the resident community. The terracing of the facades creates ideal lighting conditions for the courtyard area whilst maximizing the land use. In addition, terraces on all floors ensure generous gardens for all. building block and city are interwoven. At the open entrances to the courtyard, both ornamental and drinking fountains make the summer heat bearable and provide incentives to use the new front areas. 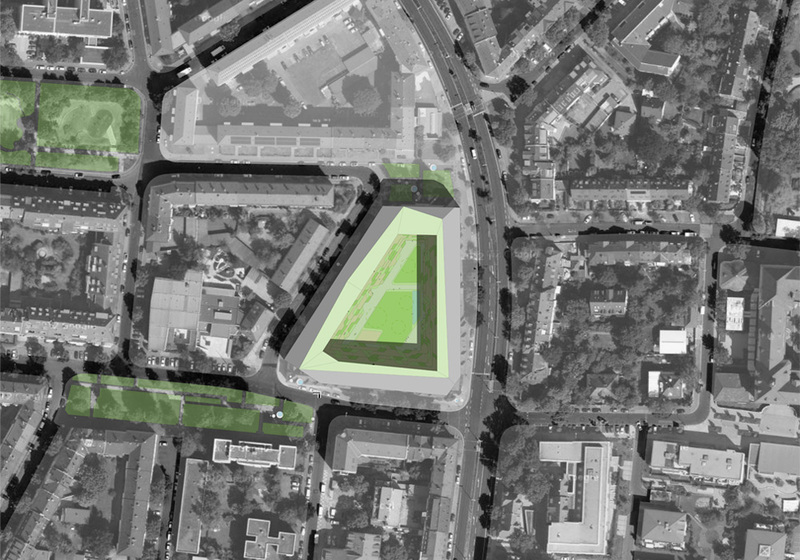 The new, small but fine Galvanipark in the north offers green areas with trees. The different commercial and residential spaces on the ground floor are arranged on different sides of the building. Public facilities are located on the busy street-sides. A day-care center, shops, cafés and such, provide essential and recreational facilities. 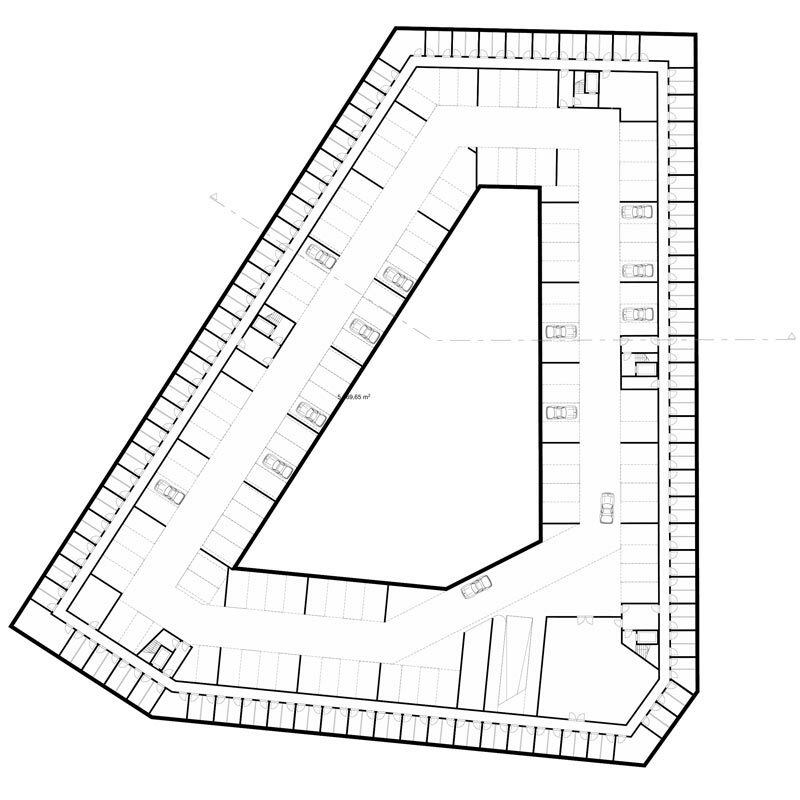 The apartments on the ground floor facing the quieter Schillerstraße are designed as a raised ground floor. The spacious green courtyard, which is open to the public, is freely accessible through five entrances. 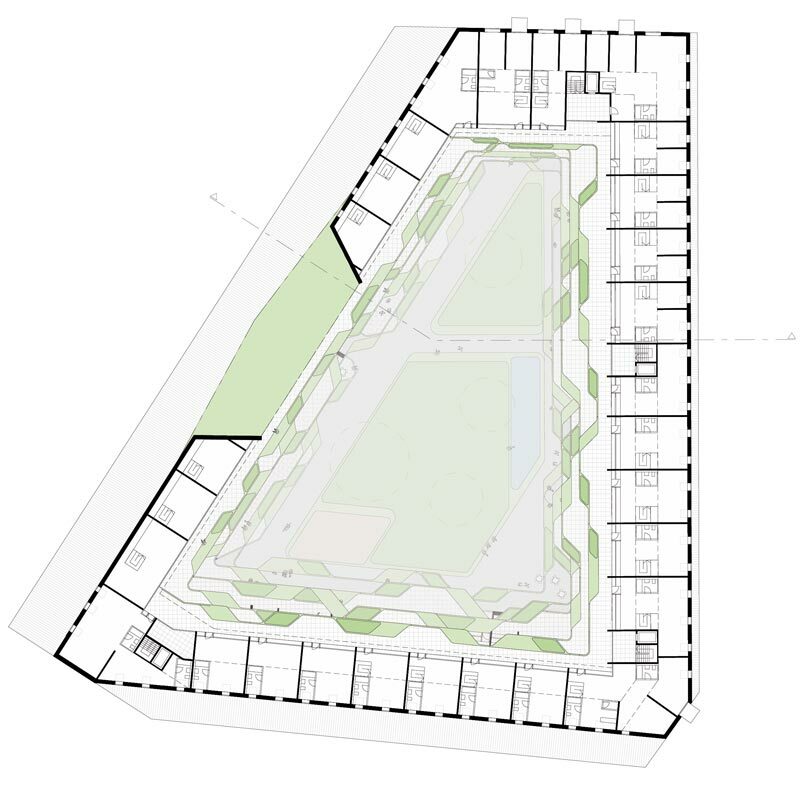 The central green area is raised above the level of the passageways and offers diverse seating as well as a play area and a bathing fountain. 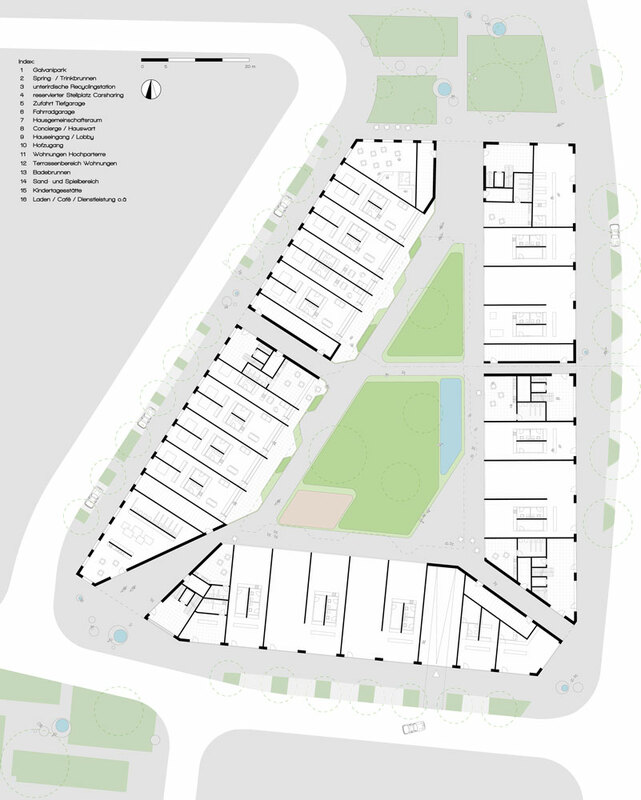 The underlying objective of the project is the creation of an integrative, socially responsible and intergenerational community area. Particular attention was paid to the quality and attractiveness of common areas and meeting places. becomes the linchpin of the concept on all levels. Via the staircases at the entrance to the courtyard you can reach the apartments along encircling arcades. These are much more than a logistical building measure. Spacious communal terraces with niches and openings, fixed plant troughs and benches, invite you to meet, chat, and spend time with neighbors. which gives quite a different impression to that on the inside. Towards the streets, the solid walls provide the necessary sound insulation and thermal mass. The hard, edgy shape of the city block is promoted by the elegant brick material, yet broken up somewhat by its varied shades. The plain tiles of the roof, contrasting against the brick, emphasize the sculpturality of the form. Regularly placed square windows formulate an urban facade. The interplay of double-doored balconies together with the external swing windows creates an additional depth. The balcony railings, which differ for each house, provide subtle visual distinctions. 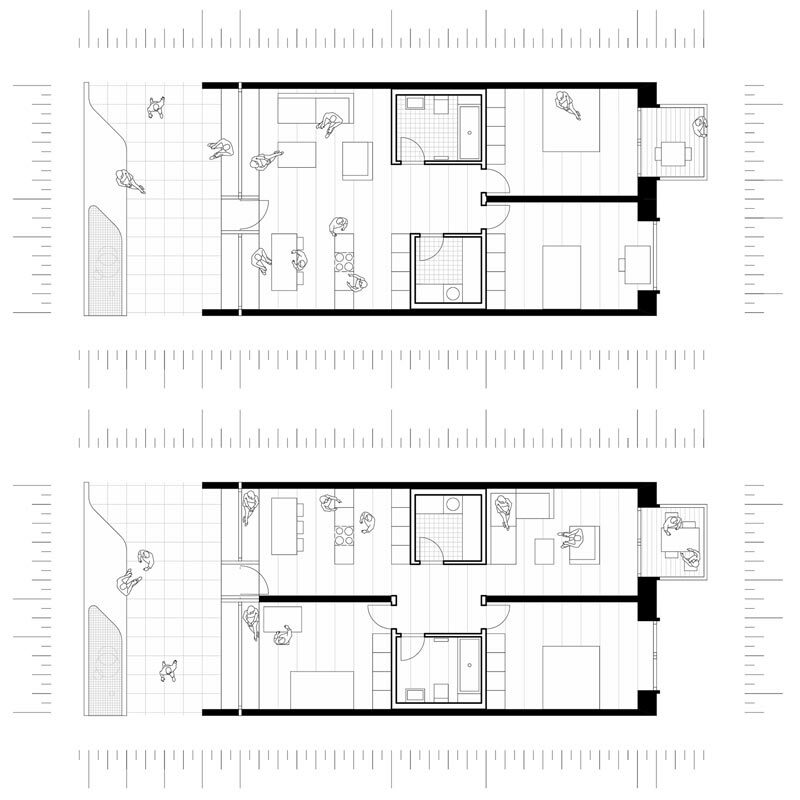 Within one axis, two-room apartments can be arranged, and across two axes, three to four-room apartments can be created. A logical differentiation between the various apartment sizes is achieved through the staggering of levels to the courtyard.